Frozen chunks of watermelon stand in for ice cubes in this refreshing lemon-lime frozen watermelon slush. Here we go, another southerner whining about the heat, but frankly y'all, it's been unbearable for me this summer. Part of blogging on a full time basis, means that you work from home, and I tell ya, it's gets mighty comfortable here in more ways than one, air conditioning certainly being one of them. I needed to make a trip to the big box store one day for all the big stuff that costs more at the local grocery store, so I got up, put on my face, did my hair, put on some "real" clothes (if you know anything about my current lifestyle, you'd know all of these are exceptional efforts anymore), grabbed my purse and headed out the door only to be slapped in the face with a wall of humidity as soon as I stepped outside. I stood there for a second, said "nope," and turned myself right around. After a few times of getting overheated and suffering the resulting headache and misery just from trying to water plants, I knew better. That was a couple of weeks ago, and with heat indices upwards of 110 degrees the past two weeks, I still haven't made that trip. The local grocery store is just around the corner, so The Cajun has been picking up odds and ends, here and there for me on his way home and we have just gotten by without that big trip. I've also been eating as many cooling foods as I can and tomatoes, watermelon and cucumbers have become a regular part of my diet. Ice cream just might be involved too. Good thing I love them all! This weekend I looked at my chunks of watermelon and thought about my frozen watermelon margarita, so I threw some cubes in the freezer in anticipation of the weekend. I didn't want the alcohol though, so I settled on the non-alcoholic, slushie version. For that one, I like to use a combination of fresh lemon and lime juice and just a bit of salt to really brighten the flavor. Oh my goodness is it refreshing! Here's how I make it. For more of my favorite beverages, visit my page on Pinterest! Cut up the flesh of a watermelon into rough chunks. Spray a jelly roll pan lightly with non-stick spray and spread the watermelon chunks in a single layer on the pan. Freeze for several hours or overnight. Remove 3 cups of chunks and reserve remaining watermelon in a freezer bag until needed. In the pitcher of your blender, add one cup of the water, lemon and lime juice, sugar, salt and frozen watermelon, in that order. Pulse the blender to begin to break down the frozen fruit, then whip until blended, adding more water as needed. Cut small wedges of fresh watermelon for garnish if desired, cutting a slit into the side to perch the wedge on the rim of the glass. 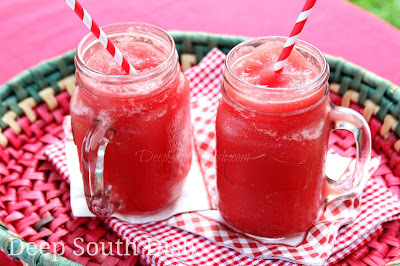 Watermelon Spritzer: Do not freeze but process watermelon chunks as above, omitting the water. Fill wine glasses with ice and add a quality sparkling wine 3/4ths full. Top off with the watermelon puree and garnish with a watermelon wedge. May also use a splash of club soda, sprite or 7up with a quality white wine. I have been drinking watermelon slushies everyday snce summer started :D i know how you feel. I rarely go out my husband complains he has to always bring things home LOL I freeze mine in a plastic container and add a little sugar and maybe some water that's it. I will try this recipe thanks :-) i have done this will all types of fruit also. Try it with the juices and just a bit of salt - fabulous! Oh, yes, I sure do know how you feel about this "lovely" weather we've been having (I'm in south central MS with central air that won't get the indoor temp under 86 in the late afternoons) and have been wishing I had something other than iced tea to sip on to give me the illusion of feeling calm & cool. How do you think this recipe would work using a Honeydew instead of Watermelon? I just cut up a huge one and thinking to experiment with this recipe. Thank you!!! I don't know but how could it be bad? I'll give it a try & let you know! Thanks, Mary, for all your great recipes & ideas. LOL I'm glad that you mentioned alcohol because the first thing that I thought of when seeing the recipe title was, "Those would be great with some tequila!" I am going to try this when I get to the store to get a watermelon. We just got back yesterday from the Muscle Shoals area of Alabama, and it was 95 every day and humid, humid, humid! What did people do before air conditioning??? I swear! I just went out to fill the bird feeds are 6 a.m. this morning and the humidity was already so thick it was uncomfortable. I've been spending a lot of time indoors for sure! I do remember being hot a lot in my younger days. Few people had central air back in the day even when they did have A/C & I spent many a night on a pallet under the air conditioner in the front of the house because the room my sister & I shared was the furthest in the house from the window unit! I still remember when there were only fans in the classrooms here too. Couldn't even imagine that today! !